Sometimes you just can’t say no. When the man who introduced me to energy gels; all around machine Trevor Sexsmith asked if I wanted to spend a week at Sorcerer Lodge for dirt cheap, there was only one acceptable answer. That answer, obviously was “I’ll find the money and get the time off somehow”, which is exactly what I did. 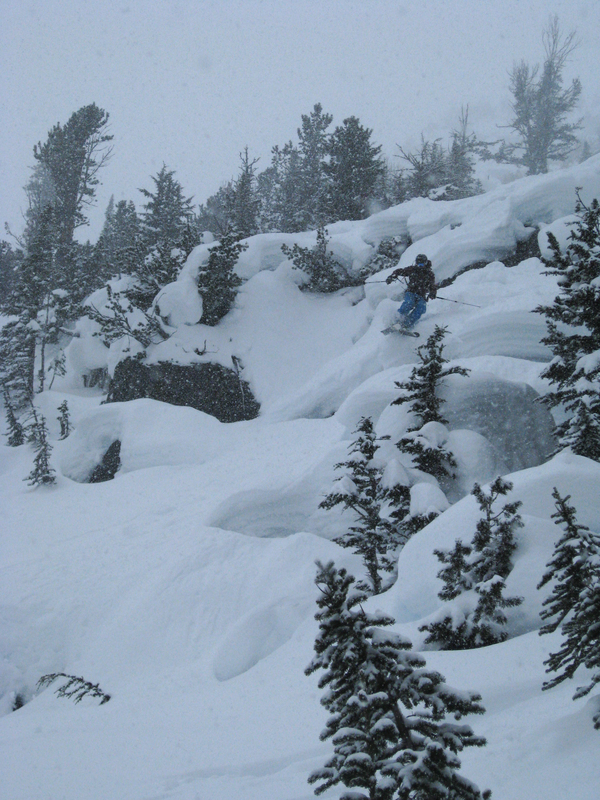 A few weeks later I was lying face down on a pile of bags in a snow covered parking lot at CMH Heather Mountain. Several seconds after that, a helicopter landing skid touched down a few inches from my head and it was time to go. Around halfway through being reminded to, under no circumstances touch any part of the heli that wasn’t the floor or seat my brain finished processing what was going on, or at least finished waking up and my excitement for my first fly in hut trip became very real. Well, I guess it’s time to go skiing. 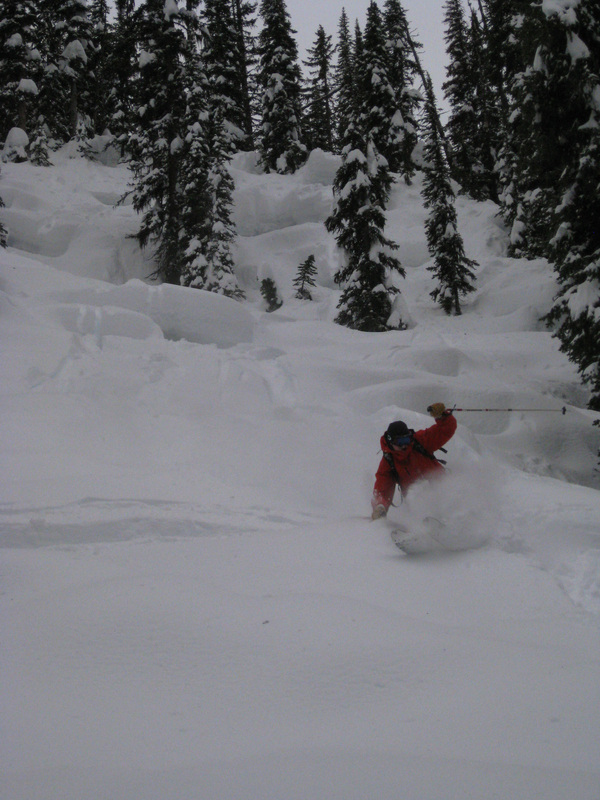 We had aced the timing of our arrival, and after arriving and unloading our gear we wasted no time in showing the 35 plus centimetres of blower pow exactly what our intentions were for the week. An afternoon’s touring yielded several laps of various moraines below the hut, a great tree run called Woozles and more faceshots than the rest of the season combined. Game on. Our second day defined the word grey, but, hoping to explore the alpine and get a feel for the conditions, we enjoyed a sendy pillow run through Lee’s Trees, directly below the lodge and punched in the skintrack up to Swiss Col. Once there, we skied over the other side and poked around the Ventigo Lake area in search of an elusive view of Mt. Iconoclast’s south face. 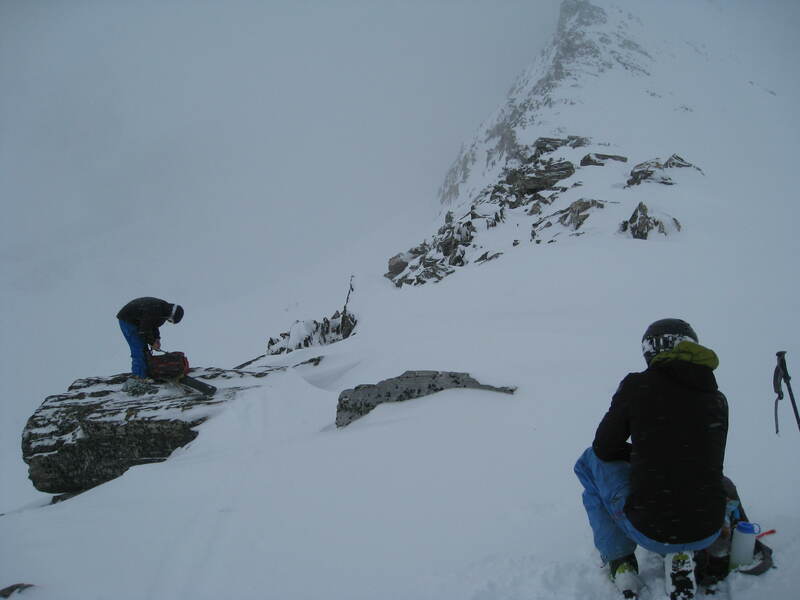 With hopes for better light, the next day was devoted to the exploration of Broadway, a ramp which provides an ideal route up the Nordic Glacier, home of some excellent alpine runs and mountaineering objectives. 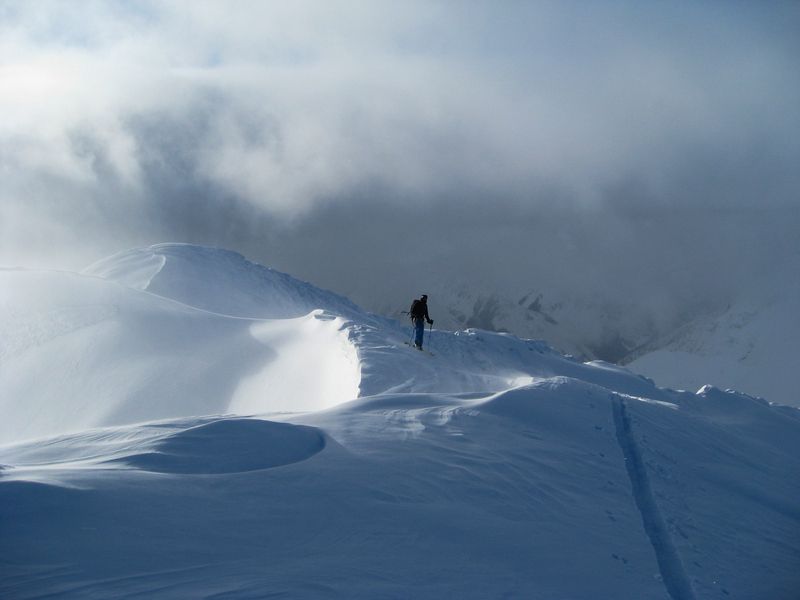 Once we roped up and probed a comfortable skintrack, we enjoyed several hours of gale force ridgetop winds while bagging the skier’s summit of Nordic Peak. The face, and its boot top dust on crust was perfect for some high speed GS turns, and made the day’s windburn utterly worth it. Wedding Bells, a steep ramp on the side of Escargot Peak provided the icing on the cake. Trevor leads across Broadway toward Escargot. Wedding bells is the obvious ramp beside his head. Having had such a good time the day before, we then decided to go big. Nordic Mountain actually consists of three peaks, all just over 3000m in height, and at some point on day three, we had discussed the idea of attempting to traverse all of them. 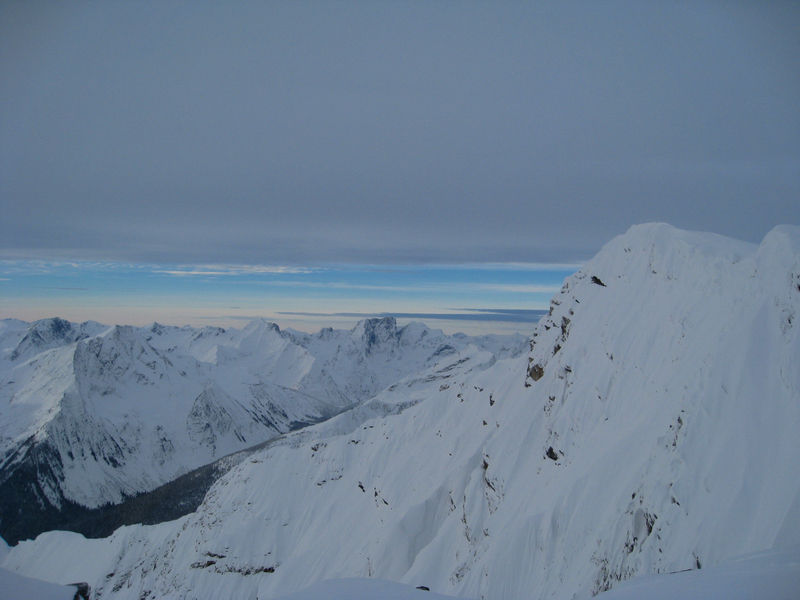 Our plan, a major modification of the Traverse of the Angels, improved the run book’s suggestion considerably and culminated, we hoped in a descent of the long face descending from the west summit. We woke up at 4am, anticipating a long day. 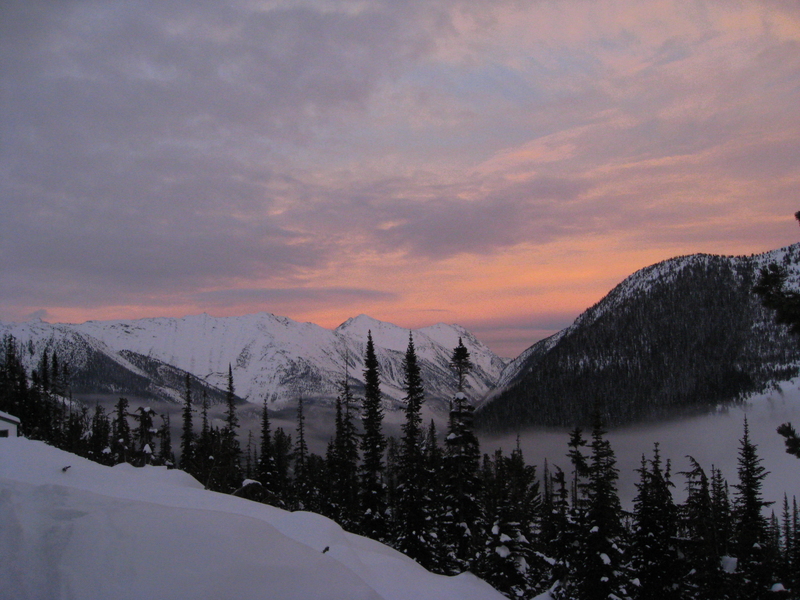 By the time the sun rose, we were high on Broadway, nearing the base of the east peak. The wind noticed what we were up to, whipping itself up into a cold, gusty annoyance that would happily blow us over if we let our attention lapse. A steep skintrack led us to the col between the east and centre summits, where we decided, grudgingly that between the wind and the steepness of the face leading to the east summit, we would skip it, instead focusing on the centre and west. A beautiful view from a very cold and windy place. Heads down, we pushed through the wind, skiing over the centre peak and down to the broad col below our last climb for the day. Trevor utilized his long legs and scampered up through the short pitch of chossy drytooling that guarded the summit ridge. Ian and I took a little longer, but eventually we all tagged the west peak without being blown off the mountain. The face itself was steep and wind affected. The visibility was terrible, and I thoroughly enjoyed it. Once the pitch flattened, the glacier became extremely broken, and we threaded the needle through sagging crevasses below Black Russian col and skied out on the bottom third of a fun looking run called Critical Thursday. The day was reasonably difficult physically, but for me, the endless negotiation of hazards was mentally exhausting. When Trevor proposed another pre dawn start the next day, I passed. 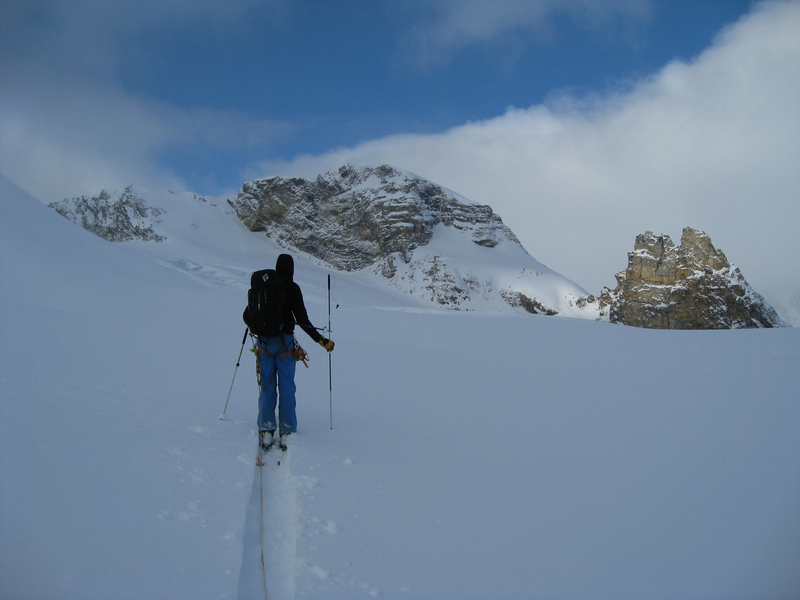 Eventually Ian did too, leading us to spend the remaining three days skiing pillows and trees, with the occasional round of rock climbing and waist deep wallowing to keep us honest. The weather slowly worsened, until finally our last day dawned blue. 35cm of fresh had come down the night before, and we enjoyed the perfect pow day to cap things off before flying out the next morning. Trevor samples the good in Talisker Trees. All in all, the trip was unbelievable. Because of the last minute nature, there were many small groups of skiers, which worked well. I suppose that with the wrong group it could have been miserable, but by the end it was as if everyone had known each other for years. Sorcerer Lodge itself is a comfortable 18 person hut with every useful modern convenience. 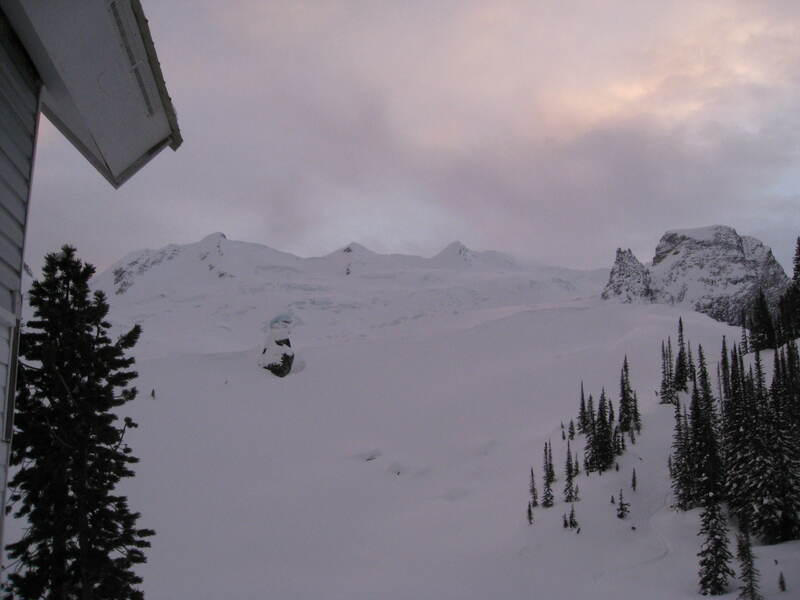 There is no wifi or cell reception, but there are radios for weather, avalanche info and emergency use. The terrain is truly spectcular, and there was an awful lot of skiing we didn’t even see. We went self guided and self catered, but options for everyone are available, along with more information at Sorcerer’s website. 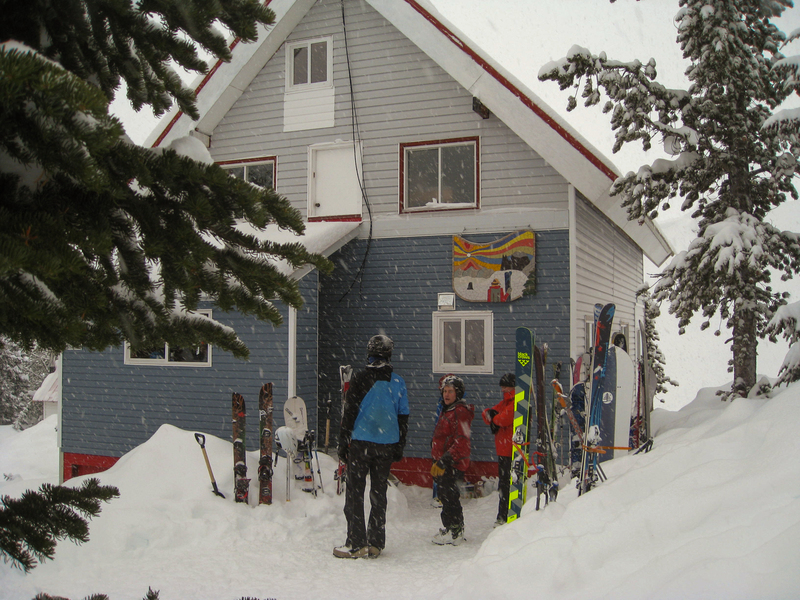 If you are in the market for some unbeatable skiing in a remote, comfortable lodge, you would be well served by checking it out. If the opportunity ever arises, I will certainly go back. An entirely tolerable view out the front door.